Jonathan Rea leads the World Superbike Championship by 12 points following a win and runner-up finish at Aragon in Spain. Jonathan Rea capped a strong weekend in the third round of the World Superbike Championship with a runner-up finish in race two at Motorland Aragon on Sunday. The Kawasaki rider, who won Saturday’s race, was thwarted in his bid for a double in Spain by Chaz Davies on the Aruba.it Ducati. Both riders battled it out in the final stages after Davies squeezed past Rea with five laps to go. There was little between them but as Rea attempted to edge close enough to challenge for the lead on the final lap, a mistake in the middle sector ended any hopes he had after he ran wide, allowing Davies a free run to the finishing line. Marco Melandri (Aruba.it Ducati), who disputed the lead at the beginning of the race with Spaniard Xavi Fores (Barni Ducati), completed the top three, 4.5 seconds behind Davies. Fores suffered heartbreak in front of his home fans after he crashed out on lap nine, gifting Rea the lead. PATA Yamaha riders Alex Lowes and Michael van der Mark engaged in a battle for fourth, with Lowes coming out on top. Rea’s team-mate, Tom Sykes, was off the pace as he ended a disappointing weekend in sixth place. Triple world champion Rea now leads Davies by 12 points after the first three rounds. 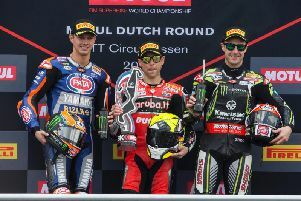 The action continues this weekend at Assen in the Netherlands, where Rea holds an incredible record, winning the last seven races around the famous Dutch TT circuit. Meanwhile, Andrew Irwin from Carrickfergus finished in 20th place in the World Supersport race on the CIA Landlord Insurance Honda.